Today is the feast day of St. Seraphin of Montegranaro (1540-1604)! Born into a poor Italian family, young Seraphin lived the life of a shepherd and spent much of his time in prayer. 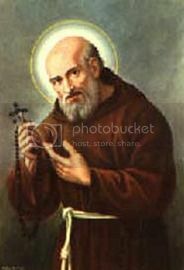 Mistreated for a time by his older brother after the two of them had been orphaned, Seraphin became a Capuchin Franciscan at age 16 and impressed everyone with his humility and generosity. Serving as a lay brother, Seraphin imitated St. Francis in fasting, clothing and courtesy to all. He even mirrored Francis' missionary zeal, but Seraphin's superiors did not judge him to be a candidate for the missions. Faithful to the core, Seraphin spent three hours in prayer before the Blessed Sacrament daily. The poor who begged at the friary door came to hold a special love for him. Despite his uneventful life, he reached impressive spiritual heights and has had miracles attributed to him. Seraphin died on October 12, 1604, and was canonized in 1767. Comment: For many people these days, work has no significance beyond providing the money they need to live. How many share the belief expressed in the Book of Genesis that we are to cooperate with God in caring for the earth? The kind of work Seraphin did may not strike us as earth-shattering. The work was ordinary; the spirit in which he did it was not. Quote: In Brothers of Men, Rene Voillaume of the Little Brothers of Jesus speaks about ordinary work and holiness: "Now this holiness [of Jesus] became a reality in the most ordinary circumstances of life, those of work, of the family and the social life of a village, and this is an emphatic affirmation of the fact that the most obscure and humdrum human activities are entirely compatible with the perfection of the Son of God." Christians are convinced, he says, "that the evangelical holiness proper to a child of God is possible in the ordinary circumstances of a man who is poor and obliged to work for his living."